Office buildings, shopping centers, apartment buildings, and other commercial properties can reap substantial benefits from rainwater harvesting. Whatever the motive – sustainability, reduced utility costs, or improved landscaping – rainwater harvesting makes great sense for commercial property managers. 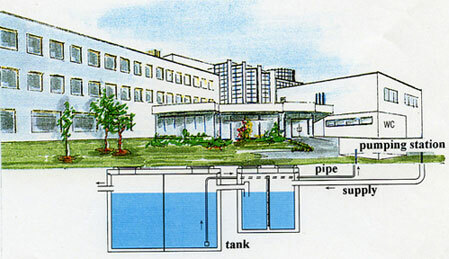 Unlike groundwater, rainwater is not hard. Without chemicals and minerals, it can prevent corrosion and scale on equipment and re-distribution systems. Captured water is free for the taking and delivery. Landscaping loves rainwater, free of salts and acids. Harvesting reduces run-off and its consequent harmful impacts. Collection and reuse eliminates periodic demand stress on public water sources. Using harvested rainwater can reduce water bills in some areas and may be eligible for tax incentives. Some 99% of the water used at a commercial site is not for drinking. It flushes toilets, runs showers, and cleans. Collecting rainwater provides a new resource, a clean source of water for landscape irrigation. The salt-free water will seep deep into the soil where it will reduce the salt accumulation that is harmful to root growth. Picture the simple process at a single home. The rain rolls off the roof into gutters that channel it into barrels or tanks. It is, then, distributed simply by bucket or hose to landscaped areas. Systems become more complex with the size of the home and the intended use, but in most simple assemblies, the system relies on gravity and the weather. Site engineering: Draw the natural drainage paths, their highs and lows. Identify natural catchment areas, and determine how planned landscaping will alter the terrain and flow. Design the means to move the water from catch areas to planting, for example, through gravity or pump pressure. Demand calculation: Measure the landscaping needs. Thirsty plants need more water over time. Rainwater is not dependable, so it is important to know how much you can rely on the catchment and on the utility water supply. Construction: Design and implementation of a new construction is easier than adapting an existing site. An existing site needs retrofitting, but new sites can match plant placement and thirst to the collection and distribution system. If you are interested in exploring whether a rainwater harvesting system would make sense for your commercial building, make sure to work with a landscape contractor who has planning, architectural, and engineering experience. Choose one that you can form a working partnership with. Review current and completed projects that resemble your size and plan. Review the numbers carefully, and see if there are tax incentives. You’ll love the outcomes!